Many devices require a low-vacuum environment for optimal performance. This includes quartz crystals (< 1 Torr), bolometers (< 0.05 Torr), and very high performance gyroscopes (< 0.001-0.01 Torr). Furthermore, excellent vacuum enables enhanced thermal isolation for Epack’s Low-Power Oven Stabilization Package. Achieving and holding excellent vacuum over the lifetime of a product can be very challenging due to outgassing–a phenomenon whereby, over time and with elevated temperature, gases are released from materials and device surfaces inside the package. 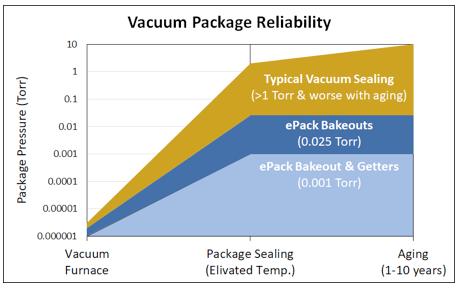 The figure at the lower left illustrates challenges with vacuum sealing. Shown in gold, typical vacuum furnaces hold a pressure as low as 0.000001 Torr. As illustrated in (gold), at the elevated temperatures needed for packaging the pressure can increase to > 1 Torr due to trapped atoms/gases (O2, C02, OH, H2, He and others) diffusing out into the very small package volume. This pressure may then continue to increase slowly over the lifetime of the product. Epack’s vacuum-sealing processes use specially-developed pre-bakes to drive out all of these trapped gases, and Epack’s packages can optionally incorporate getters to absorb residual gases and further improve vacuum. As shown in dark blue and light blue this allows for Epack to achieve vacuum levels of < 25 mTorr (without getters) and < 1 mTorr (with getters), which are reliable and last the lifetime of the product.